We are so excited to celebrate Senior Brand Ambassador and Bourbon legend Al Young’s 50th Anniversary with the brand this year. We will be commemorating this milestone with Bourbon, of course – a special 2017 Limited Edition 50th Anniversary Small Batch Bourbon will be released in his honor this June. 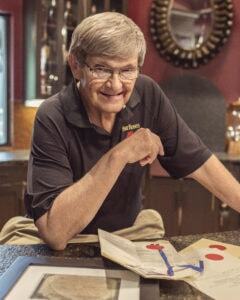 Al Young has served in a variety of roles at Four Roses for the past 50 years. In 1990, he became Distillery Manager and in 2007 was named Four Roses Brand Ambassador, a role that has him crossing the country sharing the story of Four Roses and its Bourbon. He is also historian for our storied 129-year-old Kentucky Bourbon brand, having researched archives, Distillery records, news accounts, photos and artifacts to write the book Four Roses: The Return of a Whiskey Legend, published in 2010. Al was inducted into the Whisky Magazine Hall of Fame in 2015 and is also a member of the Kentucky Distillers’ Association Kentucky Bourbon Hall of Fame. We sat down with Al, the Bourbon legend himself, to get a bit more information on the limited edition Bourbon and his 50 years with Four Roses. This Small Batch Bourbon is made up of four of Four Roses’ 10 unique Bourbon recipes. Tell us about the recipes that you chose. When asked by Brent for some guidelines to use for this particular Small Batch Bourbon, I said that it would be nice to use some that had been produced while I was the Distillery Manager here at Four Roses. As far as ideas for a flavor and aroma profile were concerned, we both agreed to consider a hint of cinnamon, peaches and cherries, plus aromas of gardenias and magnolia blossoms. After numerous discussions between the two of us, a number of samples were prepared that touched on what we said we wanted plus a whole lot more. Unknown to me, Brent had really liked the one that I chose in the last round of samples. In addition, it was full of hints of vanilla bean, raspberry, fig and rich mellow oak with just a taste of spearmint. We made this happen by expertly combining some 23-year-old OBSV, 15-year-old OBSK, 13-year-old OESV and 12-year-old OBSF. What led you to choose the 23-year-old? The 23-year-old OBSV was selected due to the distinctive honey, cherry and rich oak flavors that it exhibits. Having said that, samples using various percentages of it were prepared. This resulted in a well-balanced, highly flavorful bourbon finally agreed upon by the two of us. Now let’s talk about the retro bottle shape and label that was chosen for this Bourbon. You know, we have a large Four Roses archive collection including ads and bottles dating back to the time of National Prohibition. Luckily, it includes some from when I started with the company in 1967. The unique design of the bottle from that time was chosen as a tribute to the year my career started. What does it mean to have a limited-edition release to commemorate your anniversary with Four Roses? I felt humbled by the fact that the company would choose this way to commemorate my length of service. It took a lot of hard work by many people that I have worked with to make it happen and I am happy to be a part of it. You’ve seen a lot of growth for the brand over the years. What would you say is the most significant change you’ve experienced? 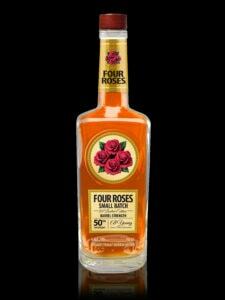 One of the most significant is the brand growth that I have seen following the return of Four Roses Kentucky Straight Bourbon into the domestic market. Working in concert with others, I have been fortunate to contribute to this transformation since before and after becoming Brand Ambassador in 2007. What would you say has been the most rewarding part of your 50-year journey with Four Roses? What is your favorite part of your job? The most rewarding part of my 50-year journey was being asked by the company to research, write and get published a book about the history of the Four Roses brand. Four Roses: The Return of a Whiskey Legend was first published in 2010, it was recently revised and reprinted in a third edition in 2016. One of my favorite parts of the job is conducting Four Roses Bourbon tastings to new people. Their responses from tasting it makes it enjoyable. You are in charge of archiving at Four Roses Bourbon. What are some of the most memorable items you have come across? One of the most memorable pieces in the collection is the pint bottle from 1924 currently on display in the Four Roses Visitor’s Center at the Distillery. It is full, minus some evaporation, and has the prescription from the Sparks Drug Store, Sparks, Nevada, on it. The bottle got added to the collection, as many items do, as the result of a phone call received from someone who wanted the item preserved in a good place. I am so glad that we have it as a unique part of our ever-growing collection. What’s next? How do you plan to continue the legacy you’ve established for Four Roses in the coming years? Well, I haven’t given a lot of thought as to what the future holds. If anything, my legacy would probably be centered around the preservation and display of our archives. I think that we need to know about our past so that we can touch on it from time to time as a resource for today’s ideas. The selection of that bottle from 1967 illustrates this to the fullest. Approximately 10,000 bottles of the 2017 Limited Edition 50th Anniversary Small Batch Bourbon are planned for distribution. The Bourbon will launch on June 10, 2017 at Whisky Live Louisville. Throughout the month of June, we encourage our fans to share what Al has taught them on Twitter using the hashtag #AlTaughtMe.